All transactions are safe and secure with a reliable history in online purchasing behind each of our associates. Buy the Sheldon Bazinga t-shirt to own Big Bang Theory clothing and merchandise. 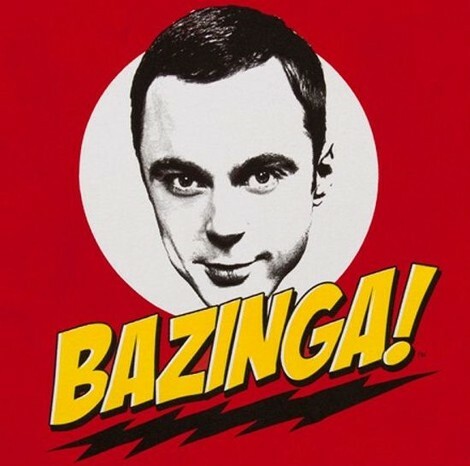 When you unveil the details of a prank, deliver an insult, or accomplish a difficult task, don't hesitate to punctuate your revelation by excitedly yelling, "Bazinga!" like Sheldon Cooper from The Big Bang Theory TV series. For example, he uses the phrase after he suggests to Leonard that one of his charts is wrong. After Leonard fixes the chart, Sheldon tells him that it was right all along. "Once again, you have fallen for one of my classic pranks. Bazinga!" This Sheldon Cooper Bazinga t-shirt celebrates the term. In addition to the Sheldon Bazinga tee above, browse the Big Bang Theory Clothing Gallery for more apparel like men's and women's clothes, kids shirts or hoodies.